the home, farm and studio of Lee Zieke & Lindsay Lee. On a wooded farm in rural northeast Iowa it is here that we practice our trades of willow basketry, landscape design and painting. Willow is such a natural and totally renewable resource - a sturdy basket woven of its boughs will carry countless cargoes while delighting the eye for many years. Please click on our 'Willow' page to learn more. Garden design, on the other hand, is what Lindsay calls 'the supreme art form' which he has studied and practiced much of his life. Whether you seek help with your home landscape or a commercial setting his goal is to help you obtain a 'perfect fit' with your gardening plans. The 'Garden Design' page will deliver more information on this fascinating service. Please be patient with us as we update these pages - our hands do better with soil and sticks - keyboards are another matter! For more than 20 years Willowglen's gardens have grown to support a wide variety of hardy perennial flowers, woody shrubs, and trees. These gardens are a living catalog and serve as a reference and inspiration for Lee & Lindsay in their work. They are open for viewing to those taking a class at Willowglen or visitors during the Northeast Iowa Studio Tour each October. There's a song called 'Willow, Weep for Me' along with countless other lyrics all implying weakness and tenderness. 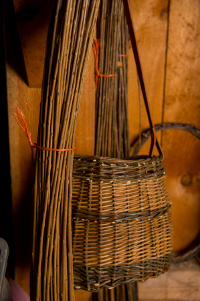 Yet we can weave willow rods together to make a basket that can be filled with stones. For centuries, vessels made of willow have carried cargoes heavy and light, from coal to carrots. Click on one of the the side menu choices to continue learning about this wonderful, natural, renewable resource. Beautiful landscapes are not the result of owning this flower or that patio set. A beautiful landscape happens when all the parts are considered and arranged with an eye toward creating a feeling of continuity and style. Click 'More' to see how Lindsay can help you create your 'beautiful' landscape.